Ships Direct From PHG. Please allow 3-4 Days Before Shipment. 3-1/2" Commercial Plain Bearing Hinge with square corners. This hinge is for commercial or heavier residential applications. All steel base material. Features non rising steel pin with button tip and plug. Heavy 0.12 Guage(3.1mm) thickness. Five knuckle design. Also available with 1/4" round corner. For doors equipped with automatic closer or high traffic use ball bearing hinge. Size - 3-1/2" x 3-1/2"
Gauge of Metal - .12"
Wood Screw Size - #10 x 1"
*Above images do not represent this product. They are intended to show available finish options only. There are many types of door hinges available for different applications on residential doors. This guide and the charts at right are intended to help you select the appropriate hinges for your door and is stated as suggestion only. The best way to replace existing hinges is to buy the same size and quantity of hinges you already have on your door. Below are a few things to consider before buying hinges for a new door or replacing old hinges. Door hinges are generally made in three types of material. The most commonly used is steel. Steel Hinges are very strong and inexpensive. 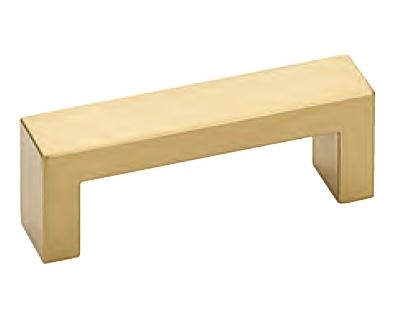 They are usually plated with other materials (brass, nickel, bronze), and are available in many finish options. 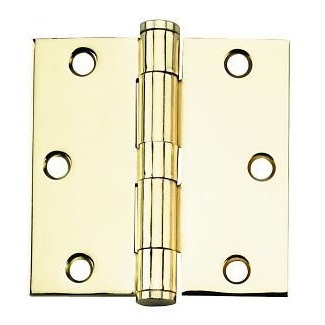 Solid Brass Hinges are also strong but will not rust or corrode as steel will over time. Solid brass hinges have the most beautiful appearance and can outlast steel plated hinges by many years. Stainless Steel Hinges are stronger than steel and are resistant to rusting and are available in a brushed or polished stainless finish. Many door hinges for standard applications are plain bearing hinges, meaning that the hinge knuckles bear on each other. Plain bearing hinges are less expensive and work great for lighter or limited use doors. Hinges do wear out over time especially on high-use doors and heavy or wide doors such as an entry door. An upgrade to the plain bearing hinge is the Ball Bearing Hinge which has small ball bearings between the hinge knuckles to reduce friction. Ball bearing hinges increase the life of the hinge, tend to be quieter, and make the door easier to open. over 2-3/4" 6" x 6"
Hinges are sometimes catagorized as standard or residential duty hinges and heavy duty hinges. The difference between a standard duty hinge and a heavy duty hinge is the thickness of the plate material the hinge is made of. Heavy duty hinges can be used for doors that are heavier or wider. Ball bearing hinges are an upgrade from heavy duty hinges and are also constructed of thicker material. There are three styles of door hinge corners. Square, 1/4" radius corner, and 5/8" radius corner. 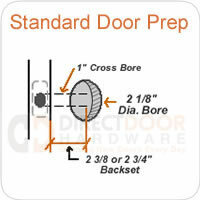 For a good fit, make sure you get the right hinge corner style for your door. You can use some spare change to determine the radius on your hinges. The 1/4" radius is close to the size of a dime if you hold it up to the corner of the hinge. A 5/8" radius is close to the size of a quarter. On wood doors you can always "square" the corners on your door and jamb with a sharp chisel. Some hinges are square on one leaf and rounded on the other. This hinge is frequently used for steel or fiberglass doors hung on a wood jamb. These hinges are available in several finishes and they are handed so you'll want to make sure you order accordingly. Spring Door Hinges are used to create a self closing door. Some areas require a fire door between a garage and living area to be self closing. These hinges are heavy duty steel hinges and are available in many finishes. You can adjust the tension on the spring for door size and weight. Most exterior doors will require two spring hinges to close properly. Non-removable pins are used on the hinges of outswinging doors to prevent intruders from tapping out the hinge pins and pulling the door off it's hinges. The hinge pin will have a groove in it which is locked in place by a set screw. The set screw is positioned so that it can only be accessed when the door is opened. Any of our Emtek Hinges (except Emtek spring hinges) can be ordered with non-removable pins. We have many hinge accessories available to create your own custom look including hinge pin ball tips, steeple tips, and hinge pin door stops. Does this hinge have a removable hinge pin?